The following steps need to be performed when using a Windows server as a host to LANSA Client. If you wish to use an IBM i as a host to LANSA Client, refer to Prepare an IBM i as the Host for LANSA Client. These steps are based on the demonstration material provided by the Visual LANSA Partition Initialization process. Using the demonstration partition will allow you to quickly test LANSA Client. To execute LANSA Client against your own data, you will need to load your application files into Visual LANSA. You will need the LANSA Windows CD-ROM to perform these steps. 1. Install Visual LANSA on the Windows Server. 2. Set up communications using the LANSA Communications Administrator. Select Settings and Administration from the LANSA system's desktop folder and select LANSA Communications Administrator from the sub menu. Select the Advanced option on the Menu bar and choose Listener. Change the Number of Threads to 2. Press the Start Listener button. a. Logon on to Visual LANSA. b. Enter your Password and, before you press OK, select the Partition Initialization button. c. Press OK and the Partition Initialization dialog box will open. 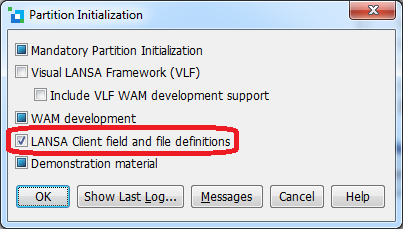 In the Partition Initialization dialog box, select the software that you wish to install. d. For LANSA Client, select (i.e. tick) the LANSA Client field and file definitions. Press OK. There will be a short delay while the fields and files are installed. 5. Perform SYSEXPORT: From your LANSA System's desktop folder, select Settings and Administration, Utilities and then SYSEXPORT. 6. Run the *CLTEXPORT: From your LANSA System's desktop folder, select Execute Applications and then Exec Process. 7. Add the LANSA Client Licenses by selecting the Licensing - Server Licenses in the Settings and Administration folder. You should have been provided with an xml file. From the New tab, select the xml file then apply the license. If successful, license details should appear in the Applied tab. 8. Confirm that the x_lansa.pro file exists in the directory which corresponds to the LANSA Client partition. For example, the DEM partition has a directory named <drive>:\Program Files (x86)\lansa\x_win95\x_lansa\x_dem. 9. Save the new x_lansa.pro file in <drive>:\Program Files (x86)\lansa\x_win95\x_lansa\x_dem directory (Assuming "x_dem" is the directory that you are using).